Nicole Pouchet speaks at the “Writing Social Commentary Through Genre Film” event in Seattle. 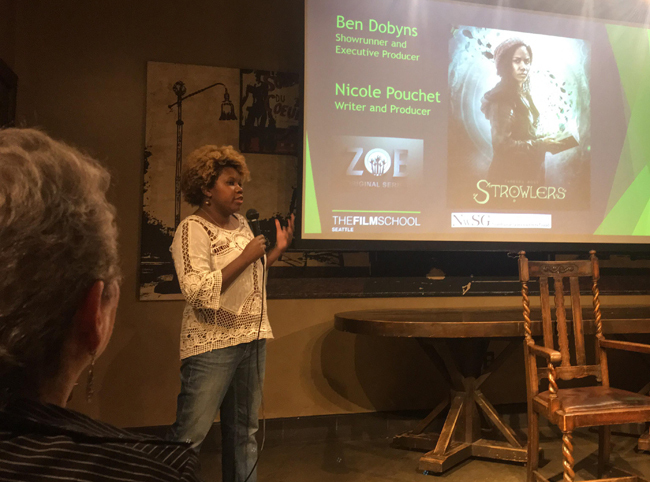 Last night, the Northwest Screenwriters Guild partnered with TheFilmSchool to present a workshop titled, “Writing Social Commentary Through Genre Film: A Presentation by Ben Dobyns and Nicole Pouchet.” The true goal of the workshop was to prove that film can change the world and to learn how to do it. Then we continued with my presentation. Dracula, released in 1931, was one of the first talkies. At that time, there was no “horror” genre; it was classified as a “mystery.” Dracula ushered in concepts like sound effects, supernatural themes, and actual horror. While this film didn’t exactly change the world, it started the horror genre and made implausible subjects acceptable to filmgoers. Dracula allowed for horror, fantasy, and science fiction to exist in the future. We also examined the films Guess Who’s Coming to Dinner and Philadelphia. Both of these films helped change global mindsets about marginalized people. With its 1968 release at the same time as the Supreme Court case, Loving vs. Virginia, Guess Who’s Coming to Dinner helped ease some reluctant Americans into acceptance of interracial marriage. The 2004 science fiction, The Day After Tomorrow, did more to convince the world that climate change is real than any film before its time. Released two years before Al Gore’s An Inconvenient Truth, The Day After Tomorrow generated more than 10x the news coverage of the 2001 United Nations Intergovernmental Panel on Climate Change report. Even though the science of the film is questionable, it helped change global views on climate change, and even directly contributed to successful fundraising campaigns for Greenpeace and National Resources Defense Council. Jordan Peele won an Academy Award for Best Screenplay for the horror/social thriller, Get Out, in 2018. For a film that Peele thought would never be produced, this is amazing. Get Out highlights police discrimination as a tool of horror, something for audiences to accept rather than question as part of the narrative. With commentaries like these, Get Out started conversations about the micro-aggressions and racism of suburbia. After reviewing these five films and understanding that film does have the power to change the world, I had a conversation with Ben Dobyns, the executive director of Zombie Orpheus Entertainment. For the past two decades, Ben has worked with a diverse team of storytellers to develop and produce projects that seek to normalize women’s rights, LGBTQ identity, racial justice, indigenous cultural revitalization, and economic justice through the lens of genre comedies and dramas. We discussed many topics, specifically the importance of using a relatable character to explore current topics. With each of these films, the emphasis was on a relatable character facing a conflict. These characters wanted the same things that everyone else would want: love, respect, family, and safety. By the end of these films, audiences were forced to consider the main characters’ plights, regardless of whether or not those specific struggles matched their own. The audiences learned something while being entertained. There’s so much more to discuss on this topic. We can change the world with our writing. It’s up to us to dare to try.